Are More Common Than You Think, See How We Can Help! Even if you’re a safe driver and take good precautions on the road, other drivers might not be driving quite as carefully. 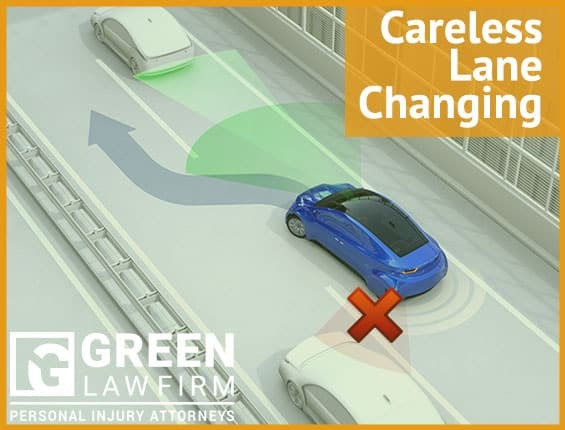 Particularly when you’re driving on the freeway, the unexpected can happen and you might find yourself in a situation where you need to avoid getting hit by an unexpected and careless lane change. Knowing how to handle these situations can help. We’ve put together a brief explanation on how to handle a quick and unexpected lane change to help you avoid an accident. This applies particularly if you’re driving at a high speed. You might need to speed up for the car behind, but need to slow down for the car in front of you. Sometimes when you’re in a lot of traffic and there is a lot of lane changing happening such as before an important or popular junction or freeway turnoff, it’s important to expect that lane change might happen. Be prepared to break quickly and be conscious that a quick lane change might occur. Simply knowing that you may need to break might help you avoid an accident. If there is someone behind you that is too close to the rear of your car, move safely into another lane when it’s possible. A lot of multi-car accidents happen because a number of cars are tailgating when the accident happens and a chain reaction occurs. It’s important to maintain an awareness of the speed of the traffic around you and drive at a comfortable speed that factors in the possibility of something unexpected happening. If you see someone wanting to change lane, slow down and provide them with the space they need to move into your lane. Sometimes, especially if you’re trying to get somewhere fast it can be tempting to not let someone in, however, they may be reacting to other traffic or a narrowing lane that you cannot see and may require a change of lane. If you notice that you are driving in another driver’s blind spot, it can make sense to speed up to pass or slow down to ensure that you remain within visibility. You can never be certain that someone will know to check their blind spot so it’s essential to be aware of this, particularly with larger vehicle and trucks. By following all of the steps above, you can significantly reduce the chance of getting into an accident. Of course, it’s also important to be aware of making good lane change manoeuvres yourself and to check both rear and side mirrors as well as indicating in good time before you change lane.